The Halabri are a species closely related to the Luhabra. Though they share a common ancestry, the two peoples have a long history of enmity against each other. 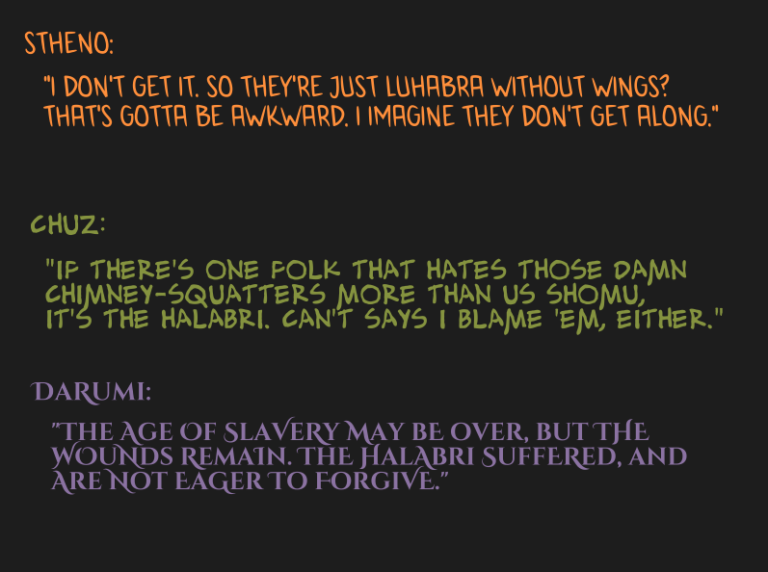 Unlike their Luhabra cousins, the Halabri do not possess wings. With less elaborate crests, they also lack hollow bones and are far more accustomed to ground life. Though physically tougher and more resilient, they were often derided as “the low ones” by Luhabra and often demeaned to menial labor in ancient times. After a centuries-long struggle for independence from Luhabra rule, the Halabri adapted well to life in the Samsharan empire. Most migrated southward to avoid the Luhabra, for whom they still harbor a deep distrust. 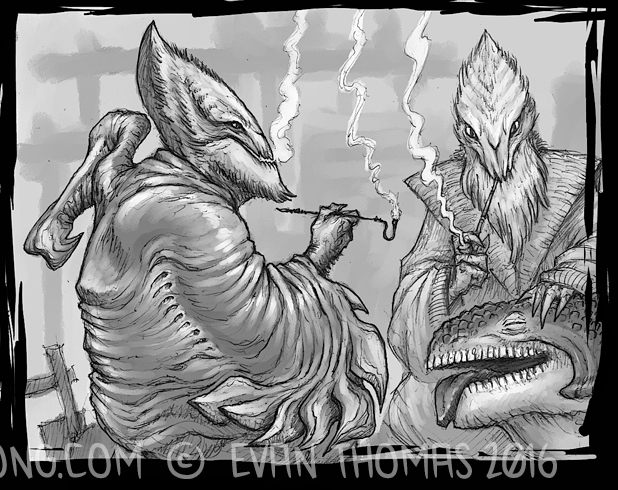 Many Halabri have prospered in house Hajadim by breeding and selling “Twitch Robes”; living symbiotic cloaks that offer defensive armor, weaponized limbs, or even wings in exchange for a modest tithe of blood. While many races keep and raise Twitch Robes, Halabri have become the most common practioners of the trade, pioneering especially in breeding winged robes, allowing them to approximate the flight that the Luhabra have lorded over them.